The box I ordered was stripped of its original packaging by the time it arrived in my hands (my uncle from the UK was very kind to make space for it in his luggage!) so I took the liberty to remove the Citadel band that encircled it as well to investigate the contents and fiddle around a bit. What you get underneath is a 40cm x 28cm x 10cm container that looks pretty cool to start with. With the right paint job this box can look quite menacing I think. 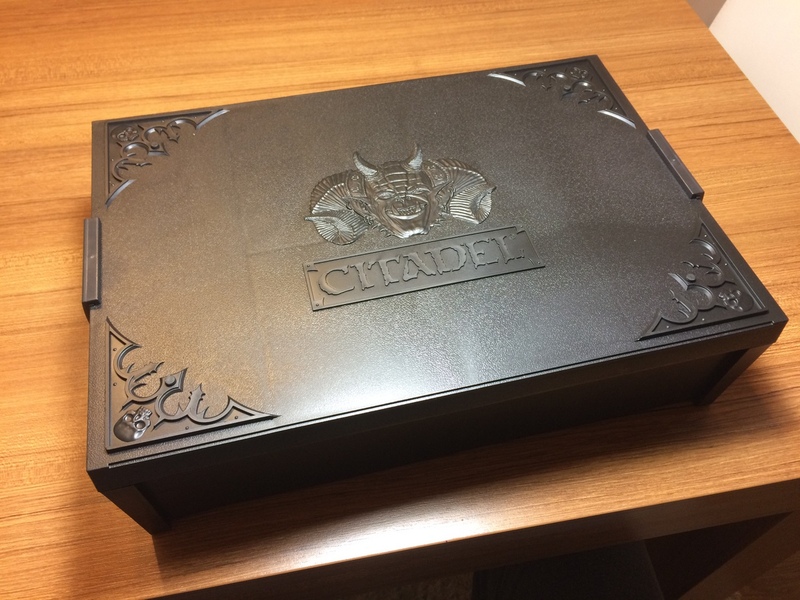 The top lid has the painting demon (or the Golden Daemon himself if you will, considering the award pics) face embossed on the plastic with the Citadel brand underneath. The whole image is framed with ornaments and skull imagery on the corners. So if painting the box is your thing (I know a lot of people paint their Citadel carrying cases) there’s a lot of room to be imaginative. The skull corners also sport plastic buds that work as stabilizers when you flip over the lid to prepare your workstation. Top lid is secured by two handles similar to the hard carrying cases. This is quite necessary it seems as the lid does move a little even with these clamps down. So for those who are wondering, no, it does not seal airtight. A bit of a letdown really but let’s continue. Right below the lid there’s the 49 slot paint rack (for 7 x 7 Citadel paint pots) that can be removed to access the open space underneath. A few steps back to take a look at the underside of the lid. 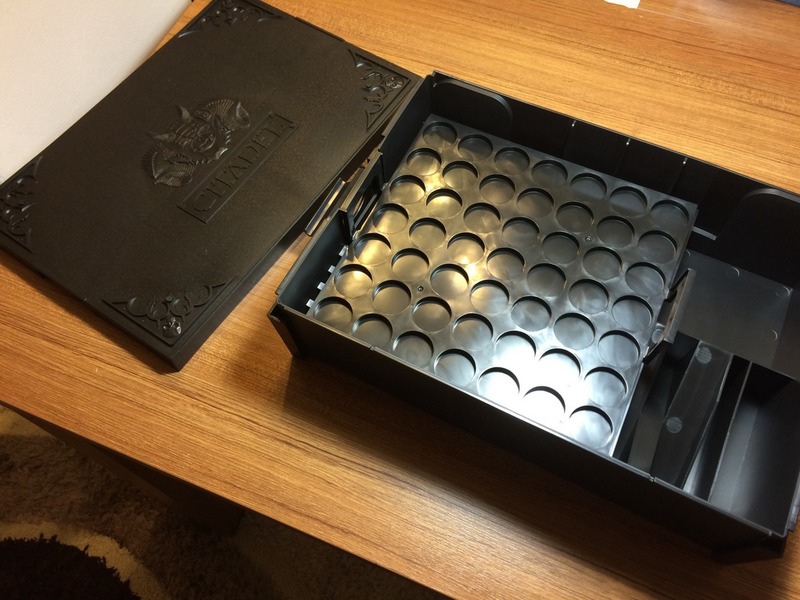 As advertised on the site and the YouTube video, the lid closes down on the box to create a work space for your minis on top of the box where you can store a specially designed cutting mat on the bottom rectangle, the new palette pad above it and your minis and tools on the sides. When the inverted lid is put over the box the side locks can “secure” the lid once again to further “stabilize” your space. I use quotation marks because I doubt that this was the intention when the clamps were designed, they have a very loose grip on the lid. Nevertheless it does prevent the lid from flying off the top during a carrying accident if you ever decide to move the setup to another location, such as away from the dinner table like at my place. Interesting idea but I think the design falls short on a few points. More on this later. Back to the paint rack. The rack is slanted on one end so your paints don’t rest flat on the working surface. Might be cool to some, I foresee myself being clumsy with them and spilling things. Also for some reason I cannot explain I thought the rack somehow attached to the box in the front, which is not the case. Duncan confused me with his video it seems. Not that I would like to have it attached to the box, that would just create a really awkward position for me to work on minis. Not in favor of putting 49 easy to spill pots right in front of the cutting mat! Now for the part that got me interested: the compartments. 2 slots for basing kits (Citadel brand), 1 for the water pot, one for the glues, ramps for the tools, another slot for WIP models and another ramp for brushes and files. Basing supplies go here. I had one for WH40k, so I’ll be placing it. Duncan from GW used a water pot and glues for the slots and his working tools in the ramps. The remaining small slot is… well… too small for anything other than sub-assemblies I’d say. The second ramp is decent. At first look I was very excited to see a design that carefully stored all the tender devices I use in modeling, be it sable brushes or files. The top two spots seem to be designed for the readily sold basing kits by Citadel, my WH40k kit fit in one of those perfectly. The other I intend to fill up with other larger materials that got leftover from the specialized compartments. Other than that, I followed the example set in the ad video when moving into this box. Yep, that’s the old Battleforce box. Hopefully I’ll be able to decommission it. The trusty paint and work station. We’ll see if the Project Box will be able to replace this. A size comparison between the current station and the Project Box. An idea I had when looking at the two side compartments. Of course you have to stabilize the palettes with tack or something. All this time I’ve been using the old “Space Ork Battleforce” box to store my things but over time it became more and more difficult to contain everything in one place. Also I’ve used the mobile work station designed more for relaxed painting/building in front of a TV or something and not a dedicated desk since space is a bit of a problem in the house. So, I had hoped that the Project Box would be able to end these problems in one fell swoop and started packing stuff into it. I packed the majority of my most essential tools into the box. And this is what’s left in the previous box. So, after a bit of reorganizing I managed to store the most essential pieces into the box without cramming things too tightly. What was left in the Battleforce box was a bottle of lining ink, old palettes, hobby fasteners, some droppers in their packaging, and the large knife set which I didn’t want to separate yet. But more importantly I cannot store the patches of cork without breaking them apart in this little box so that’s a little minus point there. Not the end of the world, just irritating. The lid doesn’t close properly. On all corners there’s a little budged out part. Not the best kind of workmanship here. Regretfully the assembled box does not firmly hold all the essential items I have put in. I either have to make a little room so that the warps on the sides and the corners do not appear or I have to contend with this. I’m still mixed on the quality of the material as it seems sturdy as the plastic in the Citadel carrying case but does bend when force is applied from the inside. Better bend than break of course but since the visual aspect is mostly what you pay for the product it’s disheartening to see that the little flaws here and there stand out so visibly. Otherwise just go get an art box readily available from most craft stores for a much better price. The Citadel Project Box is exactly what the name says: a project box. If you’re looking for an all-time solution to all your storage needs (something like a station to hold all heavy duty items like drills, basing cork etc), then this is not a good product for you. I certainly could not store every single item I had mashed inside the Battleforce box into the Project Box. This tool would work well if you want to move a few miniatures or some sub-assemblies that you need to work on to another location (like I did with the airbrush booth I had with my buddy in the past), and frankly nothing more. So first make up your mind about what you want to do with it. It still works for me as I wanted to downgrade from the large station I have to a smaller one. Based on the not so insignificant price tag I assumed the box to be of superior quality that has no imperfections visually. Unfortunately the box has the downside of swelling on the sides and corners (basically where the handles cannot press down) which make it look unnecessarily filled up. I haven’t tried loading more paint on the rack so I reckon I’ll have to leave out some more items if I add any more colors to my palette. Another design flaw I thought was the need for an entire section where the paint rack stands go: a rectangular section shot off from the other compartments. Perhaps the legs of the rack could be bent or a different design could be implemented to avoid this loss in space given the already small box. 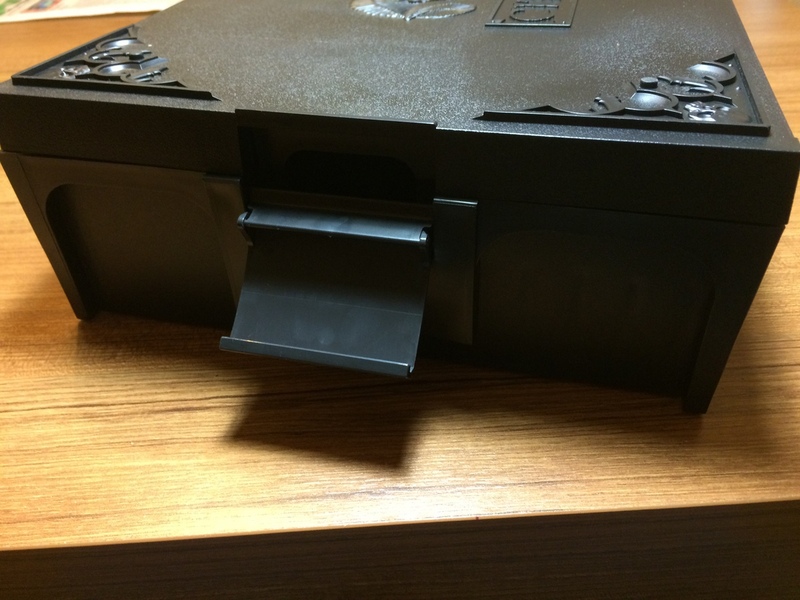 The sectioned off parts under the lid have a curious design: the bottom parts of the sections (where the cutting mat goes and the sides) are missing so anything that you put in there can slide off easily. That may cause accidents with the cutting mat for example if you drag your knife on the surface towards yourself to make a long cut and suddenly you move the mat onto you… not a good idea. I think GW could have implemented the working solution they had with the paint station and its cutting mat: once placed down it’s secure and doesn’t move. About the side spaces, it’s a mystery what was intended to be stored there. So I’m thinking of attaching the palettes with some putty and use like the paint station. That said, the box as a multipurpose tool would be useful to people like me lacking real working space or a dedicated workshop area. This I think is the most important aspect as I had to move both the paint station (or the cutting mat) and the old tool box on top when moving stuff. These do take space and can be distracting when you open them to reveal more stuff. If I need to move away the hobby materials I’ll be able to simple put everything back in the box once done, close the lid and stash it away in the new miniatures cabinet on the bottom level. I’m a fan of modular tools and furniture so I think I’ll adapt to the flaws and shortcomings of this box in short time. I have to note here that I had ordered the cutting mat that fits with this box as a package deal but somehow the delivery demons forgot to bring it along with the box. I have every confidence that the cutting mat works just as good as the one that fits the Citadel Paint Station I currently use. Edit: Yes! The cutting mat fits perfectly. However the correct use here should be to stick it with poster tack to the slot otherwise it slips when you cut on it or when you want to close the lid back on the box. I hope this review was useful to you in determining the use of the box. If you like, share some alternate solutions or your own setups in the comments and I’ll update this post with them as a reference for future hobbyists. I’m glad you liked it. Wanted to go through this in a thorough manner. I thought I mentioned the price in the article but it seems I missed it. It’s 40GBP from the online store, the cutting mat is 8GBP as extra. Hate to say this, but … a good quality toolbox from your local B&Q (or even Aldi and Lidl) will serve me better. Okay, it hasn’t the company branding, but I see many other advantages. This is also what I thought after I got the box, it’s definitely not the all in one solution I was expecting. For extensive tool users a larger, proper toolbox is always more preferable. 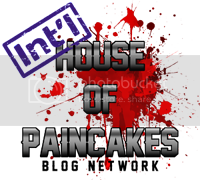 Thanks for stopping by and providing an alternate idea! Thanks for doing this review. It’s a shame their project box quality doesn’t match their recent batch of tools. I’ve been really impressed by their cutters and mouldline scraper. Given the quality of the box and it’s warping, I’d almost be tempted to ask for a refund. I’ve heard good stories about GW customer service. Try giving them an email, and show the photos of the bowing. Maybe they will send you a replacement unit that doesn’t have the same weakness in the plastic. That’s exactly why I went straight for the box, I’m in love with the files and the scraper from GW. Contacting them is a cool idea. I have heard nothing but positive feedback for GW’s customer service so I guess it’s worth a shot. Will update this space about how it goes. Out of curiosity are you still using it? I too have the older paint station and a lack of household space issue and am just wondering if it has longevity or has been replaced by now. Hey diggah, yes I’m still using the box. There are of course better alternatives for a better price if you’re upgrading to something new but having it I don’t see the reason to invest in another model. Oh right. What alternatives are they? I’ve looked around but haven’t found anything that’s enclosed like this. Need to close it up to stop little hands getting on sharp things. I’d practically just move into any hardware store to check what’s available. Usually the midsized toolboxes have the compartment amount and size you’d need for the minis and the sharper tools. It’s difficult to pinpoint brands as each country has different selections. Oh I see. Thought you meant other dedicated project boxes. Yeah I’ve had a toolbox for model stuff for about 25 years. Its rather full now tho. Maybe I need another. Thanks for the reply.